David Olson, MD, is faculty in the University of Minnesota Program in Sports Medicine and is associate director of the University of Minnesota Sports Medicine Fellowship. He also directs the sports medicine curriculum at the University of Minnesota North Memorial Family Medicine Residency and co-directs the Twin Cities Sports Medicine Conference. 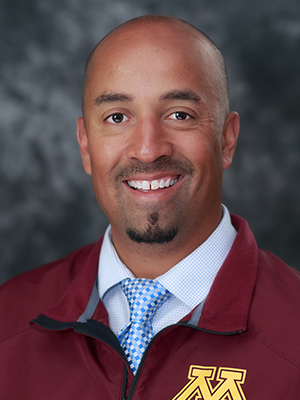 He enjoys providing team care for high school, college, and professional sports teams, including the Minnesota Vikings, University of Minnesota Gophers, Minneapolis Community and Technical College, and Roseville Area High School. VanBaak K, Olson D. The female athlete triad. Curr Sports Med Rep. 2016;15(1):7-8. Maxwell S, Olson D. Common tendon injuries in the hand. Curr Sports Med Rep. 2015;14(6):428-9. Krohn AR, Sikka R, Olson DE. Heat illness in football: current concepts. Curr Sports Med Rep. 2015;14(6):463-71. Maxwell S, Christensen T, Widstrom L, Galagedera N, Nelson B, Sikka R, Olson D. Online pre-race education improves test scores for volunteers at a marathon. Minnesota Medicine. 2015;98(4):44. Olson DE, Krohn A, Sikka RS. Thoracic and lumber spine injuries and sacroiliac region pain. In: Koutures C, Wong V, eds. Pediatric Sports Medicine: Essentials for Office Evaluation. Thorofare, NJ: Slack Inc; 2013.